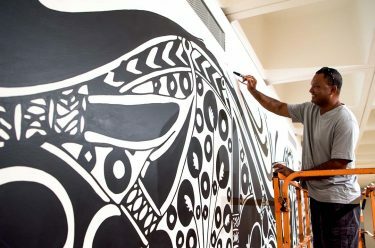 Daniel Boyd is a Brisbane-based artist of both Aboriginal and South Sea Islander heritage, whose works often deal with the complexity of the history of South Sea Islander labour in Queensland and its legacy. This is one of our state’s most important historical narratives, with some 62 000 labourers brought to Queensland in the early 1860s, initially as slaves, then as low-paid contract workers — particularly on cotton, banana and sugar farms. The heat and humidity of the north, accompanied by the scarcity of white labour and its much higher cost, meant that South Sea Islander and Aboriginal labourers worked under slavery-like conditions to fulfil the requirements of the rapidly expanding agricultural frontier. As the white towns and settlements grew, the presence of thousands of these black labourers was perceived as menacing by the north’s white citizens, and with growth in the white labour force and the push of newly formed unions, legislation was drafted to forcibly remove the South Sea Islanders from Queensland. In 1901, the White Australia Policy was enacted, and over the following decade, a program of mandatory, and often arbitrary, repatriation took place. Following the program, very few South Sea Islanders remained, mostly those who had married a local. Boyd’s paintings, reworked from historical source imagery, are covered in transparent, resin-like dots that become a lens through which the world is viewed and distorted — a comment on information known and unknown, and the processes that have rendered certain histories knowable and unknowable. His compositions leave large parts of histories metaphorically erased, and only small pieces of knowledge — in the form of tiny dots — are retained for the viewer to interpret and reconstruct, forming an imperfect ‘whole’. 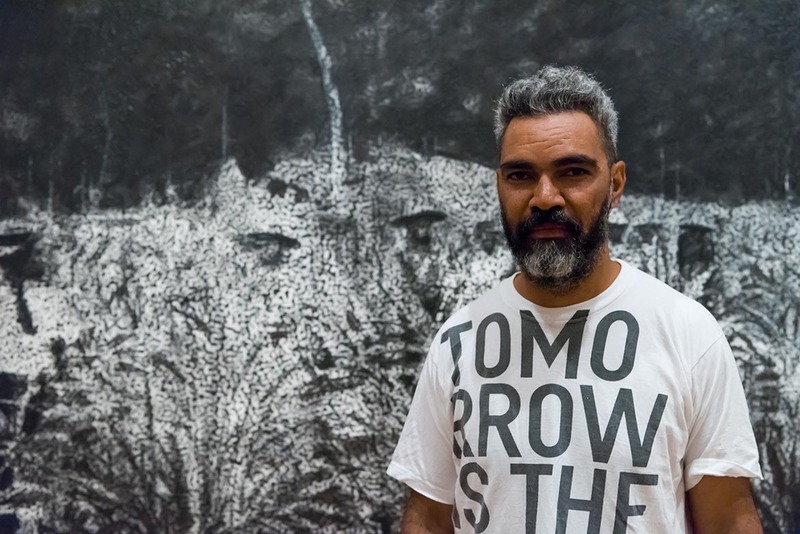 Boyd’s works are a visual representation of the destruction of the histories and cultures of Indigenous Australian and South Sea Islander peoples throughout colonial history. In this new commission, Boyd has recreated a scene from the Hambledon plantation, a sugar farm not far from Cairns. In 1888, the Hambledon had 900 acres of planted sugar cane, and employed 32 white, 29 Chinese, 6 Javanese, and 176 South Sea Islander workers. The land clearing was done first by Chinese labourers, and the field work was continued by the Islanders. For their efforts, the Chinese and Javanese were paid £1/5 per week. White workers received up to £4 per week; the Islanders, just £6/5 per year. Here, Boyd has reworked an historical photograph in which a white overseer stands among the black workers in a cane field. 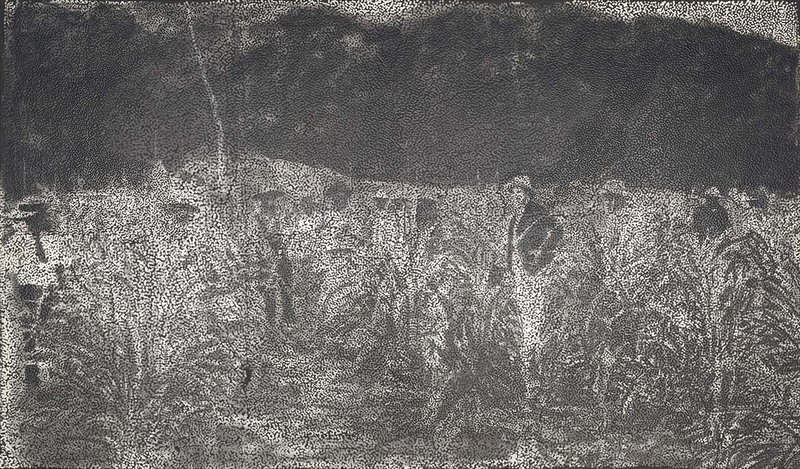 The artist has said of the image that ‘the tension is palpable’ as the white owner or overseer poses near centre field, while the black labourers stand with their tools, engaged in field work. The story of the Hambledon plantation deeply affects many South Sea Islander families in the north. Today, the area of the plantation spans the Cairns suburb of Edmonton, and on the original site sits an amusement park named ‘Sugarworld’. Originally conceived by sugar industry giants CSR, but now owned by the Cairns City Council, the park houses waterslides, swimming pools and bars. 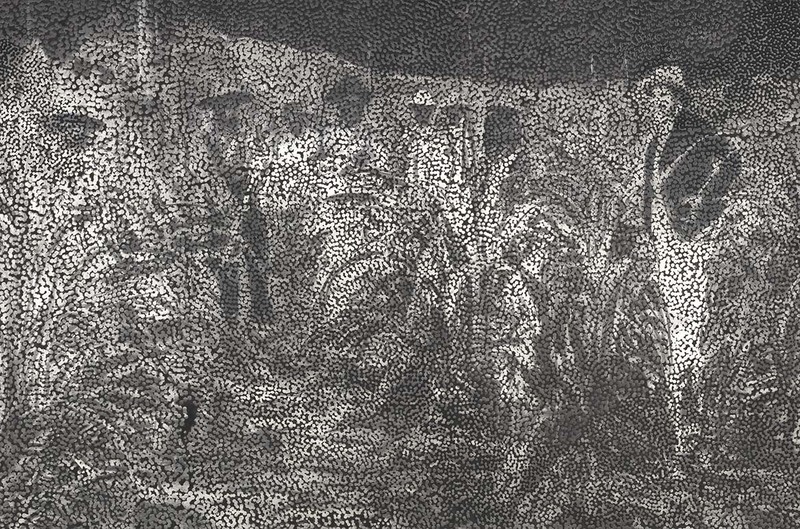 The influence of Australian history on Aboriginal and South Sea Islander people is evident, in Boyd’s painting, a white plantation overseer watches, hands on hips, over Islander labourers whose hands are likewise occupied by tools and implements. In a space that tells Australian histories through art, this work — which comments on our often brutal past — allows us all to celebrate and acknowledge the significant contribution of Aboriginal and South Sea Islander peoples in the making of this country. Through the QAGOMA Foundation, this commission has been supported by an anonymous donor, without whom this history might have remained untold. This commission can be viewed as part of the Gallery’s Australian art display in the Josephine Ulrick and Win Schubert Galleries, Queensland Art Gallery. 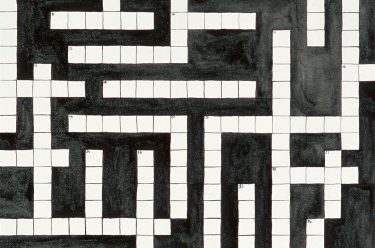 Crossword: How well do you know your Australian Art History 1933–78?